‘Twas the day before Christmas, and there I was, trying to decide what wine to pair with the red pepper and spinach quiche. A Riesling, a Pinot Gris? Traditionalists be damned. Nope, I went with this stellar Chardonnay. 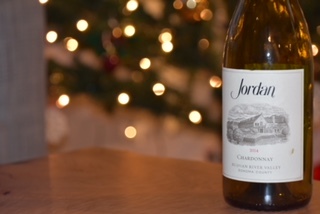 I’d been wanting to drink this with someone worthy since acquiring it at the Jordan Winery in summer 2016. Now was my chance! If you ever have the opportunity to visit Jordan, do so. This link will show you why it’s an experience that mustn’t be missed. With its golden tone, and aromas of spiced yellow apple and yellow plum, apricot and white peach, this Chardonnay is fruity, yet elegantly subtle. The palate is dry and beautifully juicy with flavours of golden apple, lime zest, lemon verbena, and honey with quince and oak. It shone – juicy acidity cut through the creamy egg, and the fruity palate was perfect with the apple and plum chutney. 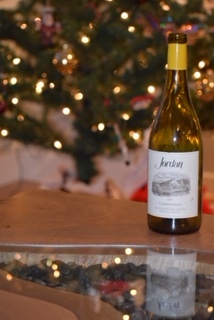 This entry was posted in OTHER and tagged 2014, american wine, chardonnay, John Jordan, Jordan, Jordan Winery, Lisa Mattson, Russian River Valley, Sonoma County, US wine, white wine. Bookmark the permalink.